Our two Midnight Screenings, both underappreciated “cult” films from the ’70s, come early this week. Enjoy! What better way for a sexually charged, forlorn, wayward soul of a film to begin than with a sexually charged image of the de facto modern male in the early ’70s, Clint Eastwood, pouncing on a small child, only to reveal that his pounce is actually a falter, a fall of the most forlorn, wayward variety. 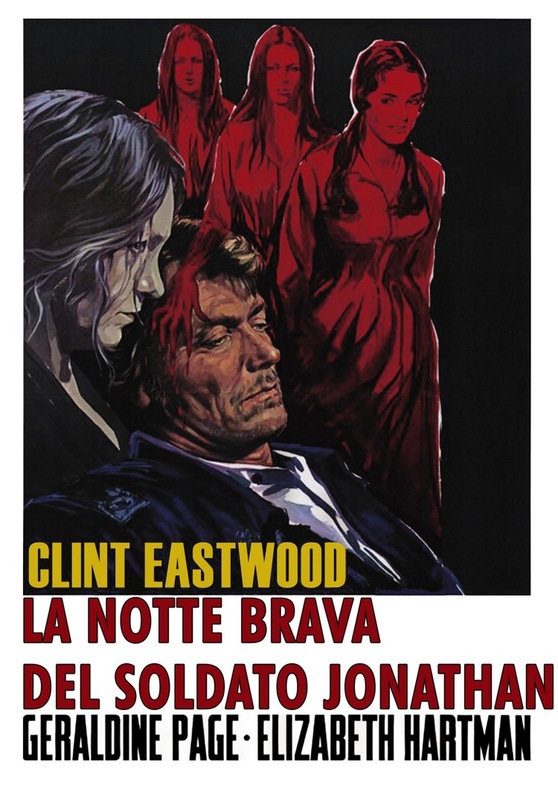 In Don Siegel’s promiscuous, weathered Southern Gothic swamp, Eastwood plays a wounded Yankee soldier during the civil war lost in the lashing foliage of a Southern forest, only to find refuge in a Southern boarding school for girls. Sexual tension protrudes and a lurid, sweaty hypnotism beckons everyone toward the sinister underbelly of the deep South. A region which refers, in this film, both the geography of the United States and to the unmentionable regions of the human body. Director Don Siegel was of a distinctly carnivorous branch of taciturn directors (such as Sam Fuller) who favored a brutal clarity and stripped mercilessness to their work, excising all interstitial material for films that chose to pummel with their narrative economy and ruthless precision. The Beguiled was a late period work for Siegel, but that same spirit pressures The Beguiled forth with a momentum and persistent diction that leaves no room for extraneous sub-plots. Siegel does seem to have studied the times though, and if his mid-’50s films were progenitors of the American New Wave, The Beguiled also exhibits the more flowery, sensationally poetic habits of the European directors emerging around the early ’70d. Words flow slowly like molasses; we feel the weight of every breath and every statement. We understand the characters as victims of their location, trapped within the primal impulses of their inner-beings, cored up under the harsh finishing-school Southern gentility their headmistress trumpets as the backbone of Old South living. Siegel glides over the murkiest physical regions of the forest, accentuating the glaring, ungainly whiteness of the plantation-style boarding school as an unfitting marker of humanity’s feigned superiority over nature. But as with any Southern Gothic film, we are trenchantly aware that nature is always ready to lash out and sink the building, and the stuffy, inhumane morals that buildings buttresses, back into the cruel ground. There are many bayous for The Beguiled to wander into and drown in, but it never gives in to the temptations of respectable, middlebrow restraint or unnecessary plot complication. It is much more comfortable prowling around the thick, animalistic Southern backwoods and pressing its fingers on the wounds of human urges. And who else to pair a director like Siegel than a star like Eastwood, a man who had paired with the director before and whose clipped, weary style matched Siegel’s penchant for minimalist, dictatorial direction. Eastwood plays a conniving figure of overworked eyes and theatrical temptations, drawing the women of the school to his chiseled features and generally taking no investment in softening up the rough and tumble demeanor of the character. Eastwood’s somewhat stilted diction (a habit of his he always turned into a positive) becomes a hint toward his character’s performative nature, toward his lies and his habit of “acting” out tales to the women rather than actually revealing the truth of his past to them. His blank slate of a performance evokes the deadened aura of life under the restrictions of war and deceit, where everyone can’t but lie to one another. Fittingly, the screenplay by Albert Maltz is less interested in the social politics of the time than the grueling infestation of choking social mores that threaten everyone. Maltz does stop over in social oppression, though. Mae Mercer plays Hallie, a slave who resides over the school, and under it, sneaking secrets and asserting potent agency over the white women who would demean her even when they don’t know it. She imbues her character with a strong-willed control over her own sexuality lacking in any other character. She clearly enjoys Eastwood’s male presence, but of all the women, only her relationship to him seems unclouded by youthful beguilement or puritanical devotion. She alone seems to generally relate to him as a person, with the film staking out a mercurial claim toward the idea that the South corrupted women as well as men, but that it in particular turned the white, aristocratic women of the gentry into socially repressed pale spaces who had to fit into their innocent, decent performative roles as “good women”. The script never once denies the harshness of being black in the South, but it also understands the small moments of agency and rebellion African-Americans could exhibit amidst all the carnal repression of life. Only Hallie seems to want Eastwood’s body with honest sexuality and control over her body, while every other character is busy clouding their human urges with the cloying morals of the time. While all the other women would pine for shaving Eastwood’s stubble, nominally so they can tidy him into a cleanly gentleman but secretly so they can touch his face, Hallie speaks openly about how she enjoys a little human hair, a little beastial freedom to her men. She still tries to shave him, but she is honest about her reasons: she has to do as she is told. Every other person in the film, Eastwood as well, is busy lying to themselves in order to assert power, pretending they are free when they are victims of their own self-imposed power structures. Their own desire to assert superiority becomes a chain around their neck. Cinematographer Bruce Surtees (with lustful, leering camera movements that accentuate the mystique of the Southern Gothic) and composer Lalo Schifrin (whose sexual, sinister score negotiates the tumorous growths of desire bubbling throughout the film) both do their best to strangle the characters even further. The Beguiled prefaces another cavernous crawl into the tamed and untamed human psyches of the outback, Peter Weir’s Picnic at Hanging Rock, although Siegel’s film isn’t as transformative or as thematically rapturous as that 1975 work. The Beguiled is, especially in the end, more of a skin-crawler and a ghoulish work of horror than a probing avant-garde slice of cinema, but then skin-crawlers and ghoulish horror films can weaponize their slow burns for socially probing purposes. When The Beguiled is on its best behavior negotiating the theatricality of Southern life, it is genuine and genuinely insightful (Eastwood’s intentionally false performance, adopting a hushed, polite diction throughout to fit in with the lie of Southern hospitality, really is a wonder). It is a very hostile film even in its calmest moments, and the heightened, Freudian melodrama of it – if not exactly a realist exercise in scientific or social fact – adapts the high theater of Old Southern life and the private impulses underneath with all the Tennessee Williams-drinking hysteria anyone with a craving for a heated melodrama could ask for. Or, for that matter, anyone with a touch of psychosexual Hammer-fried horror at bay in their hearts. This entry was posted in Friday Midnight on August 25, 2015 by jakewalters98.